Colorado has become infamous for its Taxpayer Bill of Rights, or TABOR, a constitutional amendment restricting growth in revenue collections to an arbitrary “population-plus-inflation” formula. Although TABOR has had significant negative effects on Colorado’s finances, similar proposals have surfaced in at least 30 states over the past decade. None of these proposals were approved, and in five states they were placed directly on a state-wide ballot where they were rejected by voters. Even in Colorado itself, citizens voted to suspend TABOR for five years in an effort to allow the state to regain sound fiscal footing. While it is clear that most states believe TABOR is a risk that is not worth taking, some advocates continue to peddle TABOR in an ill-conceived attempt to curb government spending. This Policy Brief takes a closer look at Colorado’s TABOR to help policymakers in other states better understand the harmful effects it has on a state’s fiscal stability. As implemented in Colorado, TABOR uses a formula to limit the amount of revenue state and local governments can collect and retain in a given year. At the state level, year-over-year revenue growth cannot exceed inflation plus the state’s population growth. For example, if in one year inflation was 2 percent and population growth was 1 percent, state revenues could increase by only 3 percent in the next year. Any revenues collected in excess of this amount are returned to taxpayers. But both components of this “population-plus-inflation” formula are extremely flawed and have been a major impediment to Colorado’s ability to keep pace with the growing cost of delivering public services. First, the formula’s blunt measure of population growth doesn’t acknowledge that some segments of the population grow much faster than the overall population, and that in many cases the fastest-growing populations place a higher demand than average on government services. Colorado’s 65-and-older population, for instance, is projected to grow 132 percent between 2012 and 2040, compared to the total population which is projected to grow around 50 percent over this time. The state’s school-aged population—those under the age of 18—is also projected to grow faster than the overall population(about 55 percent between 2012 and 2040)ii. With a significant component of the state budget being spent on these two populations (medical care and K-12 education accounted for 64 percent of general fund spending in Fiscal Year 2012), this differential in population growth has considerable fiscal implications that the TABOR formula ignores entirely. Second, TABOR’s inflation variable doesn’t allow the state to keep up with the growing costs of services. TABOR uses the Consumer Price Index for All Urban Consumers (CPI-U) to measure inflation. The CPI-U is an index designed to measure changes in the cost of goods and services that consumers buy—like housing, food, and transportation. The CPI-U does not, however, accurately measure the cost of providing state services, things like education, infrastructure, and medical care. 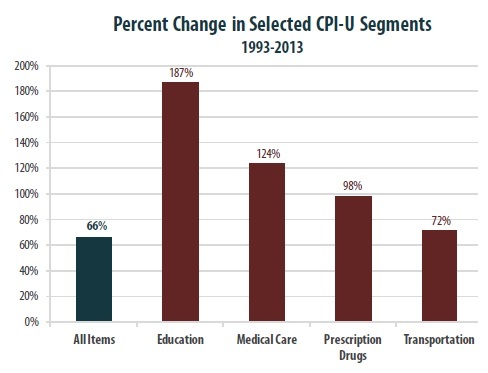 The table below compares the change in the CPI-U for all items to the CPI-U components that are most similar to state services. While overall CPI-U grew at 66 percent between 1993 and 2013, the cost of the state-related services grew by much more. Even if TABOR’s growth formula incorporated variables that weren’t so obviously flawed, the mere presence of a formula could still prevent states from meeting their evolving responsibilities in an effective and responsible way. This is because rigid formula-based revenue limitations don’t allow for the dynamic policymaking necessary to tackle new policy needs. For example, until the early 1990s, state-sponsored children’s health insurance programs were a rarity. As lawmakers became aware of the number of uninsured children living in their states, however, these programs began to rapidly expand—and today nearly every state offers some form of children’s health insurance. A formula-based revenue limit doesn’t factor in these kinds of changing needs. Additionally, formula limits institutionalize unequal treatment of different categories of spending. Some programs like Medicaid offer only limited opportunities for spending cuts because the Medicaid-eligible population must receive the health care required under federal law. Corrections spending falls into this category as well, since it can only be cut so low before the state runs the risk of subjecting its citizens to unconstitutional “cruel and unusual punishment.” The result is that TABOR has tended to squeeze out specific types of programs that, despite being critical to the state’s success, are easier to cut for one reason or another. Higher education and non-Medicaid public health programs are among the programs that have suffered most as a result of TABOR. Similarly, a formula-based approach can prevent states from addressing unanticipated events such as rebuilding infrastructure after a natural disaster or significantly enhancing education spending in the wake of a court ruling that requires the state to do so. In addition to its “population-plus-inflation” formula, TABOR prevents the state government from enacting any legislation that would result in a new tax, a tax rate increase, an extension of an expiring tax, or an increase of debt. Even if there is widespread consensus between the legislature and the governor on the merit and need of a given policy, TABOR prevents the legislature from enacting that policy if it requires a new tax in order to be implemented. To increase taxes, voters must approve an initiative in a state-wide ballot. Getting an initiative on the ballot, however, is a long and arduous process and can be done in two ways. First, it can be referred to the ballot by the legislature. Alternatively (and more commonly), citizens can initiate a ballot measure by submitting a proposal to the Colorado Legislative Council, after which they must go through a 14 step process which entails: working with Legislative Council Staff and Legal Services to ensure the proposal achieves its intent, filing with the Secretary of State, gathering the signatures of 86,105 registered votersv, and verifying signatures—all while trying to run a successful, and inevitably very expensive, statewide campaign to support the initiative. Since TABOR’s enactment in Colorado in 1992, no initiative proposing a general tax rate increase has been approved on a state-wide ballot. TABOR’s restrictions have proven to be a lose-lose for Colorado. First, TABOR makes it impossible for tax revenues to keep pace with the cost of delivering public services. Then it prevents lawmakers from enacting any policy that would address these revenue shortfalls. To illustrate this dilemma, look at Colorado’s public education finances. Since TABOR’s enactment in 1992, per-pupil funding has plummeted, classrooms have become overcrowded, and some schools have started to depend on local PTA fundraisers to pay for even the most basic necessities like heat and textbooks. To curb this disinvestment and reverse recent budget cuts, the state legislature passed and the governor signed the Public School Finance Act (SB 213) in the spring of 2013. Under the Act, Colorado was scheduled to invest $1.1 billion to improve public education in underserved communities, decrease class sizes, increase access to kindergarten, and strengthen special education programs throughout the state. In most states, the legislature’s approval accompanied by a governor’s signature marks the end of the legislative process. So in a different state, say Iowa, SB 213 would already be the law of the land. In Colorado, however, TABOR has prevented the Act from being implemented because voters must first come up with their own way to pay for the new law. In short, rather than allowing publicly elected officials to do their job, TABOR forces Colorado residents to fend for themselves. TABOR was not designed to promote the fiscal health or social well-being of Colorado. In fact, it binds the hands of lawmakers, making it excessively difficult to properly fund public investments. What Colorado has in TABOR is an institutionalized roadblock to the state’s fiscal sustainability. By capping revenue growth to an arbitrary and inadequate “population-plusinflation” formula and limiting the ability of publicly elected officials to make important policy decisions, TABOR enjoys the unfortunate distinction of being the most restrictive tax and expenditure limit in the country. v. This number changes by year. For proposed initiatives trying to make the November 2013 state-wide ballot, the number of signatures is 86,105.